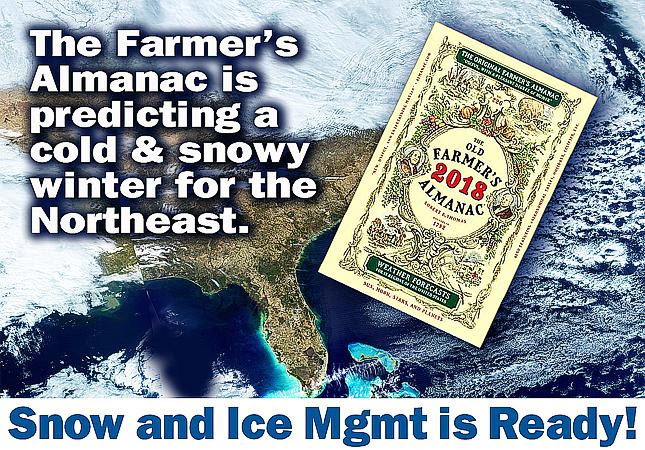 Farmer's Almanac predicts a tough winter. Be ready with great service from Snow & Ice Mgmt Co.
Regionally Servicing 7 States: PA, OH, WV, VA, MD, DE & NJ. 24/7 Call Center. Snow & Ice Management is always available for you! Localized Operations Managers checking sites during snow events for reliable & quality service. Access to Weather Works Meteorologist Services, which provide 24/7 weather updates from a live person by region. Utilizes Crew Tracker: Real time technology tracks & records progress of the site. The customer can login anytime & get a status update of their property. Timely invoicing after each snow event. Proud owner of "The Salt Factory"! Customer never has to worry about a salt shortage. Snow & Ice Management focuses on Snow 365 days a year. We are continually being educated in new snow technology for efficiencies so we can pass on the savings to the customer. DON'T DELAY. REQUEST A QUOTE TODAY.